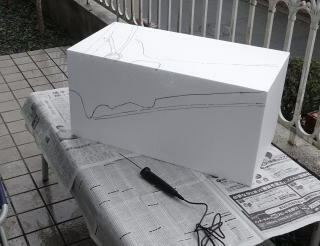 I started creating the diorama with a polystyrene block in 60 x 30 x 30 cm. 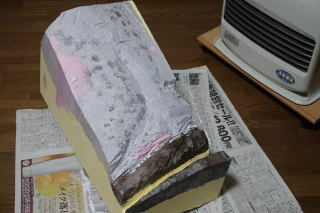 I cut it into the topography of the Crater I's vicinity using the hot cutter. I had walked in the area for many years so the topography is in my memory. 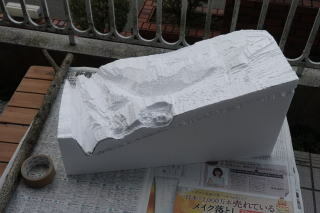 I sculpted the crater, Kamuiwakka Creek, and slopes. Sculpting the topography is completed. 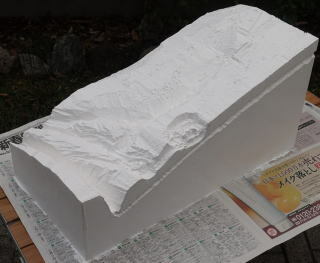 I also sculpted the hot spring aquifer on the front side which lies under Crater I.
I painted gesso, which is a base paint, so that other colors painted easily and look better. 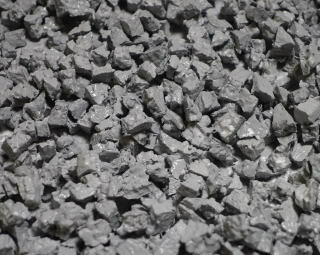 As I was waiting for the gesso get dry and hard, I tore polystyrene into small pieces and painted them in gray to create rocks. 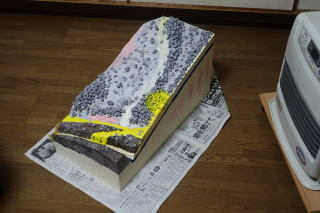 I painted colors on the surface of the diorama dipending on the geology and rock. I put rocks on the surface of diorama by bond. 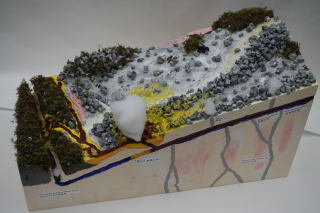 Then I poured a large amount of bond into the creeks and crater and painted in yellow for sulfur. I put moss for expressing pine bushes and some cotton for volcanic gas. Then I painted reddish brown as molten sulfur. The diorama is finally completed!